This subject has come up as a viva in the OSCE exam. How would you feel if asked to discourse on the subject for 15 minutes without prompting? The following gives you what you need to know. There is good coverage in "Basic Practical Skills in Obstetrics and Gynaecology", published by the RCOG Press. And a detailed education module by Valley Lab that is worth going through to get a solid grounding. Electricity: For our purposes it is the flow of electrons through a conductor, e.g. a metal. The electrons hop from one atom to the next. Something has to drive them along. This could be a battery, a generator like a diathermy machine or various electric and magnetic fields. 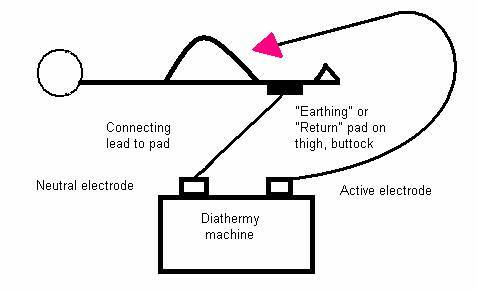 Diathermy: Diathermy means the use of electricity to generate heat. or to coagulate it to effect haemostasis or destroy tissue. Voltage. This is the force making the electrons move. The word is a tribute to Alessandro Volta, one of the pioneers in the field. Use an ordinary AA battery and you shove the electrons with 1� volts. Use two batteries, in series, i.e. one behind the other, and you get 3 volts. The greater the voltage, the more electrons flow, so the greater the current � see below. Put one finger on the top of an AA battery and one on the bottom. You now have 1� volts applied across your fingers. The resistance to current flowing through your body is so great that very little electricity flows and you feel nothing. But put your fingers in the socket of the ring main and you will probably kill yourself. The voltage of the ring main is 250 and a significant amount of current will flow. With high voltages electrons can jump gaps in air, as in fulguration below. Higher voltages increase the risk of capacitive coupling � see below. Current: this is the amount of electricity that is flowing. it is the number of electrons flying past a fixed point per second. The basic unit is the "ampere". Named after Andr� Marie Amp�re about whom you can read more here. Though why you would want to do so I do not know. Electricity generates heat in the material it is going through. The amount of heat is determined by the formula: heat = I 2 x R.
"I" is the current and "R" is the resistance to the passage of electricity of the material it is flowing through. So the amount of current is really important. A standard electric bulb has a metal filament that heats up as the electricity flows through it. For our purposes it has a fixed resistance. Plug a 12 volt bulb into the mains (240 volts) and it will become extremely bright for an instant then �blow�. The force driving the electrons is 20 times greater than the bulb is designed for. So the current is 20 times greater than it should be. The amount of heat generated will be 400 times greater than the bulb�s design limits. The filament will overheat, generating a bright flash, then melt. Resistance: This is the amount of difficulty a material presents to the flow of electricity. Most metals have low resistance, so electricity flows easily through them. Plastic and rubber usually have high resistance. The wire that goes to your table lamp has a copper core, to let current flow freely. It has a plastic covering, so that you don't get electrocuted if you touch it. Conductor : a material that allows electrons to flow through it. Copper is commonly used for electric wires as it has low resistance. Resistor: a material that is highly resistant to the flow of electrons. Everything has some degree of resistance. The exception being �super-conductors� which, theoretically, can have zero resistance. But you need to cool them to close to absolute zero. This is -273O Celsius, so not something you can achieve in your fridge or freezer. But you can put huge currents through them without generating much heat. Heat = I 2 x R.
If R = 0, then I 2 x R = 0 and no heat is generated. This is useful for creating huge magnetic fields such as are used in MRI . Interesting, but of no relevance to diathermy & the MRCOG. Capacitor: this is an electrical device made up of two conductors separated by a resistor. The two ovals are meant to represent two metal discs with wires attached. In this case they are separated by air. So, you have two conductors (the metal plates) separated by a resistor (air). Capacitors have a remarkable feature. A current flowing in one of the discs and attached wire can induce a current in the opposite disc and wire. The peculiarity is that the induced current occurs although there is no contact between the discs/ wires on the two sides. This is the basis of the ill-understood �capacitive coupling�. When you operate diathermy equipment, current flows through the instrument you use and its connection leads. This current can induce current in adjacent metal objects, or even tissues, without direct contact. The induced current could create enough heat to damage tissue. Direct current: this is electricity that flows in one direction only. It is not used in diathermy. It used to be used in �cautery�. A current was passed through a wire, heating it. The hot wire could then be used to cut or destroy tissues. this is electricity that alternately flows one way and then the other. The Grand Old Duke of York of electricity. Household electricity is alternating current. The frequency of the changes in direction of flow is 50 cycles per second. Diathermy uses vastly higher frequencies. The unit of frequency is the �Hertz�. 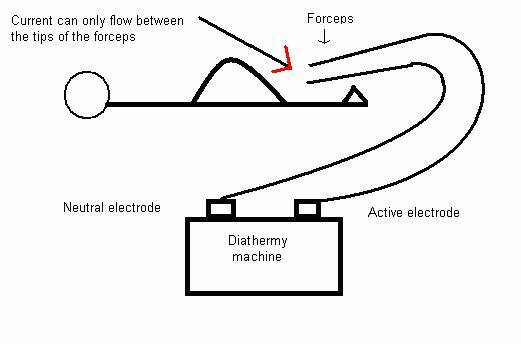 Diathermy: this is the use of electricity to generate heat in tissues. For the surgeon, the heating has to be enough to vaporize or coagulate the tissue. The electricity has to be of high frequency, usually referred to as radio-frequency. This is because it falls into the range of frequencies used for wireless transmissions. One of the main values of the high frequency is that it is too fast to stimulate nerve fibres. This means that you don�t get spasm or paralysis of muscle. To avoid these unwanted effects, you need frequencies greater than 100 kHz. Diathermy units use frequencies from 500 kHz (500,000 cycles per second) to 2 MHz (2 million cycles per second). There are two types used in surgery: unipolar and bipolar. Unipolar: this is the type of diathermy that is most often used in surgery, including open, minimally invasive, colposcopic and hysteroscopic. It is like the simple circuits you may have created as a child. 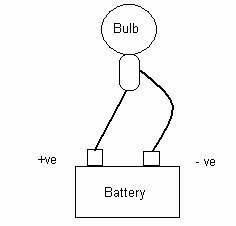 Electrons are driven by the battery up from the negative terminal, through the bulb, making it light up. They go back through the +ve terminal and through the battery. The same applies to a patient. You have to create a circuit for the current to flow round. Follow the wire from the �active electrode� on the diathermy machine. It goes to the device (needle point, scissors, forceps etc.) you will use to apply the diathermy to the patient. Once the device is applied to the patient, the current will flow from the point of contact. It will spread out as it passes through the patient, heading for the �return� pad, which is usually attached to the patient�s thigh. From there it runs back to the diathermy machine, so completing the circuit. Tissues will be heated according to the amount of electric current running through them � remember heat = I 2 x R.
The greatest current per cubic centimetre of tissue will be at the point of contact of the active electrode. The tissue in this area will usually be coagulated or vaporised. Away from the immediate point of contact of the active electrode, the current spreads out. So the amount going through any cubic centimetre will be small and the temperature rise will be insufficient to cause tissue damage. The return pad must be applied over a large area. This ensures that the return current is spread out. It cannot cause burns under the pad as the current flow per square centimetre of skin will be small. Modern machines test to ensure that the pad is properly applied. Bipolar: this is a very safe form of diathermy. The current only flows between the tips of the forceps, from the active electrode to the neutral electrode. So there is less risk of stray currents damaging tissues other that those you are aiming to damage. There are three main types: cutting, coagulating, and blended. Key data for the exam: continuous current at low voltage: 500 � 1,000 volts. The water in the cells is turned to steam, so the cells vaporise giving a cutting effect. The best effect will occur when the current flows through the smallest tissue volume. Obviously, using a clean needle point will produce this. In other modalities, the current is applied in bursts. You are only vaporising the tissue in the immediate vicinity of the needle. So you don�t need a high voltage to drive significant current into deep layers. So, for MCQs and even the dreaded OSCE viva, this is continuous current but relatively low voltage (500 � 1000 volts). Because the effect is relatively superficial and the tissues are vaporised, not coagulated, there is no great haemostasis. This is used in laparoscopic surgery for dividing adhesions, myomectomy etc. The total tissue damage is less, so smoke production is less. Key data: bursts of current at high voltage � up to 6,000 volts. The aim of this is to desiccate the tissue, but not to vaporise it. You want to generate lower tissue temperatures than with cutting current. This is done by applying the current in bursts. Usually it is applied for < 10% of the time the pedal is operated. You are treating bigger volumes of tissue and want the effect to go deeper than with cutting. So a higher voltage is used, usually up to 6,000 volts. Coagulating current provides good haemostasis. Key data. Intermediate voltage and duration of current. Current is applied for up to 50% of the time and at voltages of up to 2,000. This means slower cutting than the continuous pure cutting current, but provides coagulation as well. A typical use would be loop excision of CIN. The cutting current gives the wire the ability to excise tissue; the coagulating current provides haemostasis. This is not much used in gynaecology. It�s like a scatter-gun to blast a wide area. The active electrode is kept at a distance from the tissue to be treated. So the electricity has to pass through air (or CO2 at laparoscopy). Air and CO2 have high resistance, so high voltage is needed to drive the current. The high voltage creates an electrical arc, like a mini lightning bolt, between the electrode and the tissue. Where the arc first strikes, the tissue is coagulated. The resistance of the coagulated tissue goes up, so the arc moves to an adjoining area with less resistance. The process goes on until the area is covered. Perhaps like lightning not striking twice in the same place. The main problem with high voltage is the increased risk of capacitive coupling � see below. Presumably there is also a risk of the arc deviating to some tissue or instrument that came within reach causing inadvertent tissue damage. The smoke generated by diathermy is potentially toxic and there must be systems in place for its removal. This does not always happen - e.g. at laparotomy. The main ones will be operator error: treating the wrong tissue. Or allowing super-heated tissue after treatment to come into contact with other tissue, such as bowel, and inflict thermal damage. The same problems can occur with open and laparoscopic surgery. The risks are greater with the latter. The current could interfere with the function of electrical devices such as pacemakers. Expert advice should be obtained. The medium used to distend the abdomen at laparoscopy must be non-combustible. At hysteroscopy it should be non-conductive if diathermy is to be used, so the electric current is not dissipated. It can be used if the diathermy is bipolar, such as �Versapoint�. Pumping gas into the abdomen means greater pressure is needed to ventilate the lungs. The anaesthetist must be aware of the problems. There is a small risk of cardiac arrest. Pumping fluid into the uterus creates the potential for fluid overload. and the extent of the damage to the endometrium. This has been extensively described after trans-urethral resection of the prostate TURP. TURP syndrome is mainly due to fluid overload, but some of the chemicals used, such as dextran have been linked to direct toxic effects. This means that the active electrode comes into physical contact with something it shouldn�t. The whole of the active electrode cannot be seen at the same time, especially at laparoscopy. Thus an insulation failure half way up the probe, allowing direct transfer of current from the probe to adjacent tissue, would not be seen. You would be looking at the active tip of the instrument, not elsewhere. You might not see direct contact between the probe and another conductive instrument, e.g. the laparoscope. The insertion of multiple instruments during laparoscopic surgery increases the risk. When inadvertent damage has occurred, it is usually not recognised during the surgery and the problem may only manifest itself hours or days later. This means that any deviation from normal recovery should occasion thoughts of possible damage. Good documentation is essential if you are to keep out of court! The increasing practice of recording the surgery on video is to be commended. Below is a depiction of a capacitor. There are two, circular, conductive plates with a wire attached to each. They are separated by a gap. This could be air or any other material that is a resistor and does not let electricity pass. The magical thing about a capacitor is the ability of an alternating current in one side of the device to induce an alternating current on the other side. This occurs without there being a physical connection between the two sides. Charged particles repel those with the same charge. It�s like north and south poles on a magnet attracting their opposites and repelling identical poles. A negative electric field will also repel electrons. Imagine we apply a negative field to the end of the wire attached to the right-hand plate. Electrons would be driven from the end of the wire towards the plate, where they would congregate. As the electrons are negatively charged, this would mean that the plate would become negatively charged. This would have an effect on the electrons on the left-hand plate, driving them away. Depleted of electrons, the left-hand plate would become positively charged. 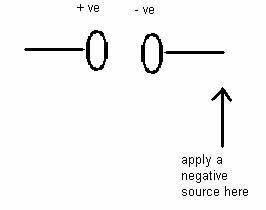 Take away the original negative source and the electrons will move back to their starting positions. Any movement of electrons is an electric current. So, the original application of the negative source to the end of the wire attached to the right-hand plate will make a current flow in the right-hand wire and plate. And the charging of the right hand plate will �induce� a current in the left-hand plate and wire. Removal of the negative source will cause reverse currents in both plates and wires. Anything that makes an alternating current in the right-hand wire and plate induces an alternating current in the left-hand wire and plate. In surgery, capacitive coupling means that you have something acting as a capacitor. A capacitor must have two conductors separated by a resistor. In the above example, it was two metal plates separated by air. The current flow must be alternating. In surgery you have the wire leading to the active probe � needle-point, forceps or whatever. The wire is surrounded by an insulating sheath. In turn, this is usually surrounded by a metal cannula. So we have a capacitor: the same set-up as the example above, except it is radial, not linear. This is meant to be a white bit representing the active wire. And an outer black layer representing the metal cannula. The blue bits just helped me put the diagram together, so can be ignored. a current flowing down the active wire will induce a current in the metal cannula. Alternative arrangements, e.g. supplying the current via an operating laparoscope, will do the same. The �stray� current flowing in the cannula will try to return to the pad attached to the patient�s thigh, just like the current from the probe itself. It will travel via any tissue with which it is in contact. In most cases the amount of current is too small to do damage. In addition, it will usually pass to the thigh pad via the abdominal wall where the cannula is in contact and cause no harm. This is because the contact is over a large enough area. But it could go via bowel or anywhere else. The worst scenario is if the metal cannula is insulated from the abdominal wall, e.g. by a plastic insert. The �stray� current then cannot discharge via the abdominal wall, so will be more likely to travel via bowel etc. and cause harm. You might think that the solution would be to use non-conductive cannulae. This does not eliminate the problem. The patient�s body acts as a conductor. Once again you have a capacitor. The conducting electrode is the probe and the wire leading to it. The surrounding insulation and non-conductive cannula act as the insulator. The body can function as a conductor outside of that. The surgeon could even be the second conductor and get an electric shock. The risk of capacitive coupling increases with high voltages, so you won�t be zapping away with fulguration at laparoscopy. The thinner the insulating layer, the closer the two conductors and the bigger the induced current. We�re back to inverse square laws, but they won�t feature in the MRCOG. Thin insulation can be a design feature in a very slim instrument or occur with wear and tear. It is reckoned that an active electrode being passed through a metal irrigation/ suction device is particularly dangerous. Capacitive coupling occurs every time an alternating current is applied to one of the conductors in a capacitor. So it happens every time you use diathermy. But it is usually so small and so well dissipated via the contact between the cannula and the abdominal wall that it causes no problem. The problem is solved by the newer diathermy machines which measure �stray� current and switch the machine off if it is at a potentially harmful level. Suggested structure of a MRCOG viva. What kind of current is used and at what frequency? Why use this kind of current? What types of diathermy current are used? What are the risks associated with diathermy? Return to "How to pass the MRCOG"
Return to "List of MCQs in the Package"